WAS THE PROMULGATION A HOAX OR ARE KENYANS READING TOO MUCH INTO BASHIR'S PRESENCE AT THE CEREMONY? A former top CEO of a state corporation meets me on the streets of Nairobi and asks if I have a minute of my time. In the two minutes of our discussion, he makes me understand that there is a serious problem in Kenya. He is convinced that the whole Katiba affair was a hoax from the moment power barons showed disinterest in it. He thinks Raila Odinga and those so called reformers that truly believed in the cause were made to believe a big lie. Mind you my friend is a Kalenjin from Rift Valley and he has no qualms letting me know how he voted. He voted No to the constitution but once the majority said Yes to it, he accepted the outcome and actually supported its promulgation and implementation. After he left, I kept wondering what that conversation was all about. Did the man have a point especially when he intimated that the first politician to be derailed was Ruto who realized much later after his rifts with Raila and other ODM members had gone too far? I want to believe that the whole constitution process was not a hoax. There could be no way President Kibaki could give his last energies to a document he didn’t believe in. The President had no reason to lie to Kenyans and the whole world before a mammoth crowd beamed across the globe if he didn’t believe in our constitution. Before I jump into the band wagon of those rights activists already crucifying Bashir, Kibaki, Wetangula and all, I would like to delve into President Kibaki’s mind wherever he is in Swaziland and decipher what is going on in his mind right now. If it is true; as it is slowly coming out that President Kibaki was personally involved in Bashir’s invitation, what was in it for Kenya and Kibaki as a person? Did he invite Bashir as a rogue neighbor that needed to be brought closer rather than shunned? If he weighed between triggering a backlash against Kenya as it has surely done; and containing a possible conflict between South and North Sudan , did he choose containment rather than a temporary uproar over Bashir’s presence in Nairobi? It is now emerging that Bashir’s invitation was kept under wraps so much that members of the ODM cabinet were kept in the dark except for Najib Balala who was roped in at the last minute to play chaperon. Being in a coalition government that has worked so smoothly in recent months, was it wise to keep the Prime Minister in the dark? Whose idea was it and how would it benefit him to keep the Prime Minister in the dark? If it is true that prior to Bashir’s arrival, the cabinet Secretary, Internal Security Permanent Secretary, Foreign Affairs Minister and his Permanent Secretary together with the Chief of Staff and Police Commissioner knew, how could such a sensitive state matter be kept away from the Prime Minister by the President? Omar El Bashir did not just come to the promulgation at Uhuru Park and left. He stayed on like a normal head of state and rumor has it; had a one-on-one private meeting with our President at which crucial issues affecting Sudan’s stability were discussed. He may have not appeared at the State House luncheon but now it is emerging that the meeting in Nairobi seems to have had a positive effect on the warring parties in Sudan over the South’s impending referendum. 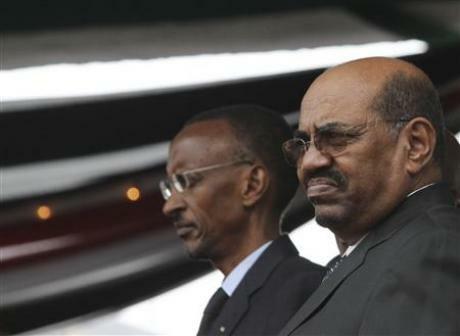 Bashir is one of the much maligned African leaders. It is also true that he has two warrants of arrest on his head. He is wanted at the ICC in The Hague for crimes against humanity and genocide. These crimes were allegedly committed under his watch in Darfur where close to 300,000 people are said to have lost their lives. Despite these accusations, Bashir was recently elected in Sudan by a landslide vote; never mind that the election process was faulty, culminating in some presidential candidates pulling out of the race. Yes, the ICC is looking for Bashir but it would be foolhardy to allow the whole of Sudan to be once again consumed in military bombs just because we are afraid to coax Bashir into allowing the South’s referendum to proceed as per the CPA Accord. 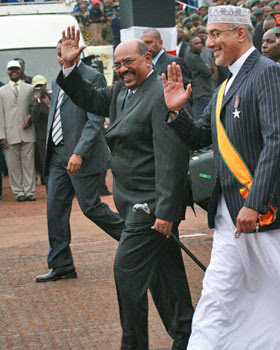 Inviting Bashir to Nairobi was downright reckless no doubt. It was not even intelligent unless some renegade political operative saw an opportunity to reap political mileage out of it. If it was merely to persuade Bashir to soften his stand on the South’s referendum, a secret meeting could have been arranged even inside Sudan with President Kibaki. Better still, Bashir could have been secretly flown into Nairobi on another day rather than the day Kenya was supposed to be at its best for the world to see. Unfortunately, politicians that thrive on negative politics have seized the moment to put spanners in to the works apparently to score points that are not worth the press conferences they have held. Sadly as usual, the media has swallowed the bait hook, line and sinker! Well, this is Kenya’s politics at its best. UGANDA welcomed the African Union's decision in late July to commit more peacekeepers to AMISOM, the AU peacekeeping mission in Somalia. Coming barely a week after Somali insurgents murdered 76 people in Uganda, the announcement demonstrated the African continent's refusal to be intimidated by terrorists. In the wake of Tuesday's vicious attack by insurgents in Mogadishu that resulted in 33 deaths, Africa's resolve is only strengthened. We will defeat those in Somalia who would keep a fellow African country from a future of stability and prosperity. Somali citizens are the most committed of all to this project. For the last decade, they have been engaged in a peace process to try and reverse their country's descent into anarchy. The years of painstaking negotiation have seen a majority of the once-warring factions come together under the banner of the Somali National Reconciliation Conference, but extremists, inspired by al-Qaeda, are now trying to overthrow the institutions created under that process, including the Transitional Federal Government — the very forum that enables Somalis to decide how they want to be governed in the future, free from outside interference and coercion. Those institutions need time to build the foundations for permanent government; unfortunately, they are under constant assault. It is inconceivable that Africans would stand aside in the hour of Somali's need. Abandoning Somalia now would condemn Somalis to the brutal rule of militants and embolden like-minded terrorists around the world. This would be a monstrous betrayal of one of our most cherished African values and the raison d'être of the African Union: community. We know that our community is especially indebted to Somalia. After all, it was Somalia that most prominently supported anti-colonial and anti-apartheid campaigns on the continent and brokered a ceasefire between Uganda and Tanzania in 1971, at a moment when our two countries were on the brink of war. Unfortunately, Somalia is now a central front in the fight against international terrorism. As terror networks are put under pressure in the Middle East, they are increasingly looking to exploit the opportunities presented by the instability in the Horn of Africa. Foreign extremists are already in Somalia, spreading their warped interpretation of religion. Just as the world came to regret leaving Afghanistan to its own fate in the 1990s, it would be a historic mistake to expect the war-weary Somali people to tame this global menace on their own. The support of the international community remains critical to winning this fight. An expanded mission will require additional resources. It is our hope that our allies in this common endeavour, in the West and elsewhere in the world, will continue to hold up their end of the bargain by providing the means to train, equip, and deploy our bolstered AMISOM mission. Africans have taken the lead by putting boots on ground; the rest of the world must provide the necessary resources to achieve our objectives. More resources are also needed to drastically improve the harsh social and economic conditions in Somalia that provide fertile breeding ground for extremism. Currently, the Somali government's total annual budget is only $250 million. In Uganda, this is roughly the amount used to pay primary school teachers each year. While the transitional government could be doing better with the little it has, adequate services will be impossible without a surge in resources. The search for peace and stability in the Horn of Africa is not just a Somali or even an African issue; it is at the heart of the global war against extremism. African nations have sent their sons and daughters to Somalia to protect a local peace process, but also to defend the global interest. It is critical that the entire world comes together to support these efforts to restore the great Somali nation and deny terrorists a base from which to threaten the world. It was indeed a new dawn; a nation reborn and a historic event no doubt, never mind the numerous logistical hiccups that could easily have been avoided. The packed crowd told it all but the dais was not just a crowd; it was overcrowded for no good reason. It displayed the high point of a disorganized state function. However, as we watched the ceremony in progress, interspersed with talking heads in our TV stations, one got the feeling that even talking heads did not know what they were talking about at times. For example, none of them could explain the relationship between the Senate. They were not sure which one was superior to the other and could check the excesses of the other. 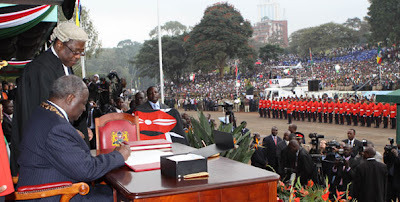 At Uhuru Park, it was obvious that the oath of office had changed. Allegiance to the Head of State as was the case in the old Constitution went with the old law. Now all state officers required to take the oath owe their allegiance to the constitution, the country and swear the oath of execution of office. This was evident as the President, Prime Minister and Vice President took their oaths of office at Uhuru Park. Friday August was indeed an important day. Its significance was evident when some MPs and even assistant ministers braved the dark and chilly morning to be there as early as 7.43am. However, in retrospect, they may not necessarily have arrived early because they respect time; it was more likely they knew there would be chaos at the VIP stand, hence the clamour for seats ahead of everybody. One fact cannot be denied. It was the largest crowd seen at Uhuru Park since independence. And the actual figures being bandied around keep changing from time to time depending on whom one speaks to. Midway through the ceremony, some media companies were reporting that about a million people were at Uhuru Park ceremony against 8000 security officers. However, the following day, this figure was down by half and by day three, police estimates were estimating 150, 000. Kenyans will never really know how many people were at Uhuru Park considering that the National census results we took in August 2009 are yet to be known 12 months later. We are not very good at counting human beings except when they are voting. Let me not go into the details why my day was spoilt. Many of my colleagues, the civil society and one set of politicians have alluded to it over and over again in the last three or so days. The Presence of Kamlesh Pattni and President El Bashir at the VIP area made my dark cloudy day even darker! To say that their presence at the VIP tent was in bad taste would be an understatement. It was repulsive and obnoxious to say the least. Nobody in his right senses can invite a murderer and a thief to his party even if they are his neighbors. The only way criminals, thieves and scoundrels are treated is to scorn them and show them that they are not welcome. Inviting Kamlesh Pattni and Omar Bashir to Uhuru Park and providing them with the seat of honour among luminaries such as Kofi Annan, Obasanjo, Kagame, John Kufuor and Benjamin Mkapa was not only in bad taste but an endorsement of impunity, corruption and genocide. The State was telling Kenyans and the whole world that things will really never change much in Kenya. For Vice President Kalonzo Musyoka, former president Daniel arap Moi and Yoweri Museveni, I think that crowd tried its best to behave. I had feared that there would be a repeat of the past acts when Moi was not only booed but had mud thrown at him. I feared that traditional anti-Kalonzo elements would try to embarrass him. 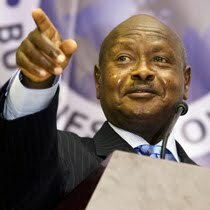 I feared that Museveni would remind a section of the crowd of the disputed Migingo Island. I was relieved to see that the crowd obeyed their leaders and behaved responsibly. Although Raila’s arrival at Uhuru Park caused a commotion and set the crowd in frenzy, his fast pace to the dais diffused the enthusiasm of the multitude. Their shouts subsided as he sat down. It was also politically prudent to have the Prime Minister and the Vice President sit together even if there was little meaningful interaction going on between them. However, I noticed that they did not sit with their wives as is common in other countries. Was this protocol or was it just lack of planning from the organizers? As a show of unity of one nation, the Reds finally ate humble pie- and attended the ceremony. It was good to see Cardinal Njue offer prayers for the document he so violently opposed until after the referendum. With him were fellow Red campaigners such as Dr. Machage Daniel arap Moi, Isaac Ruto, William Ruto among others. Considering the number of African dignitaries that graced the event, it was disturbing to invite so many former heads of state, sitting heads of state and eminent African personalities such as John Kufuor, Kofi Annan, Dr. Ping, and Benjamin Mkapa yet not recognize them in speeches or award them with medals. What was so difficult in giving a sitting head of state and a retired head of state an opportunity to talk on behalf of their colleagues? What was so difficulty in giving Kofi Annan his 5 minutes of fame to talk on behalf of his colleagues whose efforts we were celebrating? Surely, these high profile guests didn’t fly all the way to come and merely be part of the Uhuru Park crowd and a meal at State House! The curious absentee at Uhuru Park was Tanzania’s President Jakaya Kikwete who was represented by his deputy, Abeid Karume of Zanzibar. This was despite press briefings a day earlier that he would come. Incidentally the two heads of state, Yoweri Museveni and Omar El Bashir who were not in the original list showed up. Did Kikwete give the party a wide berth after international intelligence leaked that El Bashir would be attending? The President was 30 minutes late in arriving at Uhuru Park. Again, let nobody sell the idea that some heads of state were late. The protocol should know that before the programme is published, all and every detail including late arrival of heads of state are factored in. If young tell Kagame that all dignitaries must be seated at 9.00 am, he will be there 5 minutes to 9.00 am. Good governance includes the ability to keep and respect time. Wasn’t it funny that Kenya’s borders were sealed off for the duration of the ceremony yet Omar El Bashir still sneaked in? When it came to prayers for the constitution, the spiritual leader of the hour was our Maasai Priest. He was short and to the point. The other clerics made speeches instead of leading us in prayer, something that stirred the impatient crowd. One notable omission on the part of the clergy was that much as they offered prayers for the President, Prime Minister and Vice President, they seemed to have forgotten the Speaker and the Chief Justice. Incidentally; where were the Evangelicals and the NCCK brigade that opposed the constitution? Did they boycott the event or were they not invited? I think the high point of the event was when Attorney General presented the instruments of the Constitution to the President. By a twist of fate, it was Wako’s moment of glory considering that 5 years earlier Kenyans rejected the draft that he had doctored in favour of the status quo. It fell on the two gentlemen to promulgate the new constitution. When President Kibaki read the proclamation, the crowd went into frenzy! The greatest moment had finally arrived! When the President signed the instruments of the six copies of the document using six different pens at 10.23 the search for a new constitution was finally brought to an end. But it was not until the Attorney General and the Head of the Civil Service affixed the Seal on the New Constitution and presented it to the President to wave the New Constitution to the Crowd that Kenyans burst into song and dance!- Again, it was Wako’s moment of glory. As the National Anthem was sung following promulgation; as the 21Gun Salute rented the air to a jubilant crowd; as the Jumbo Flag went up at Uhuru Park, a little bird joined the celebration and hovered over the flag uninvited! There are other little details that the state function organizers should begin to pay attention to. One such thing is scripting to the minute details the sequence of events. Sammy Lui is a great MC but it is high time he started taking his job more seriously. He should learn that misleading the public to believe that the Chief Justice is about to take the second oath when in fact he is about to swear in the President was inexcusable. Had he written everything down, such a blunder would not have occurred. The lowest point of the celebrations came when our so called celebrity artists appeared on stage. The fakeness and fickleness of Caroline Nderitu was too obvious to be ignored. Performers especially poets should strive to inspire rather than struggle to impress. Her poetry came from her lips when we expected her to drive us to tears of joy. Nothing personal but it was commercial poetry at its best. However, she lifted our spirits a little when she recited her last stanza in Kiswahili. Where was Suzzane Owiyo? I thought the music was her idea with Achieng’ Abura? And what was Susan Kibukosyia doing on stage? How do you conduct a choir that is off beat and off the tune? How do you lump together big stars and amateurs and then give them no microphones to sing a song they had not rehearsed? The organizers were so unfair to Nameless, Achieng Abura, Idi Achieng and Eric Wainaina! Is this why Suzanne Owiyo was missing in action? The final goof was the balloons that failed to fly! How can balloons fail to fly in a state function witnessed by the world press? How can we supply heads of state with balloons we know they will not release into the skies? Didn’t some greedy supplier realize that balloons would not fly unless they were filled with helium? This last act was painfully comical. (New York, August 27, 2010)  Kenya should bar Sudanese President Omar al-Bashir from entering Kenya or arrest him for trial at the International Criminal Court (ICC) if he enters Kenyan territory, Human Rights Watch said today. The Sudanese state news agency has reported that al-Bashir will travel to Kenya on August 27, 2010, to attend celebration of Kenyas new constitution. Al-Bashir is subject to two arrest warrants issued by the International Criminal Court for atrocities committed in Darfur in Sudan. The first was issued in March 2009 on charges of war crimes and crimes against humanity. The second was issued in July 2010 on charges of genocide. Kenya is a state party to the International Criminal Court. The courts treaty, the Rome Statute, requires states to cooperate with the court, which includes the execution of arrest warrants. Kenya is also the site of another ongoing ICC investigation, this one focused on serious crimes committed following Kenyas 2007 general elections. The Kenyan government has pledged full cooperation with the ICC in its investigation in Kenya. As recently as June 2010, the government reaffirmed this commitment at the ICCs review conference, which took place in Kampala, Uganda, from May 31 to June 11. Although the African Union (AU) has issued a call for its members not to cooperate in the arrest of al-Bashir, African states  including Botswana and South Africa  have made clear that the call does not trump the obligations of ICC member states to cooperate with the court. An AU decision on the ICC at the unions most recent summit in July itself recognizes the need for ICC members to balance AU obligations with obligations under the courts Rome Statute, Human Rights Watch said. In addition to the warrants for al-Bashir in the ICCs investigation in Darfur, in April 2007 the ICC issued warrants for Ahmed Haroun, then the countrys minister for humanitarian affairs and now governor of Southern Kordofan state, and Ali Kosheib, whose real name is Ali Mohammed Ali, a Janjaweed militia leader. The ICC prosecutor has also issued summons to three Darfuri rebel leaders to appear for attacks on an AU base in Haskanita in Darfur. Sudan has refused to cooperate with the ICCs work to ensure justice for crimes in Darfur. In June, the ICC issued a judicial finding of non-cooperation by the government of Sudan with respect to execution of the arrest warrants for Haroun and Kosheib, which have been outstanding for more than three years. I greet you in the name of the new Republic. I must admit the journey to this day has been a long one for all of us; a good 43 years since we started fighting for the Second Republic. Our journey has been longer than that of the children of Israel. After all they only spent 40 years in the wilderness. I know today is a busy one for you considering that you have dignitaries from all over the world that have come to celebrate with us the rebirth of our nation. The crowd at Uhuru Park; complete with those spectacular military displays tell it all. It is a day that only a few people living today will compare with the same event on December 12 1963 when we hoisted the Kenyan flag and sang our national anthem. However, I would like to caution you that the crowd you see at Uhuru Park is a different one from the 1963 multitude that cheered Jomo Kenyatta and Jaramogi Odinga. That crowd was small because Kenya’s population was hardly 6 million most of whom were still trapped in poverty in their villages. Another thing; at that time, few Kenyans had gone to school; in fact very few had degrees to talk about. The most learned people that caught villagers’ attention were primary school teachers, nurses, askari kanga, and colonial chiefs. Others were veterinary clinical officers whose main job was to vaccinate village dogs against rabies and domestic animals against foot and mouth disease. In those days, there were hardly any forms of civilization except for missionary centres that specialized in civilizing us. They were the bona fide owners of mission schools and clinics that formed part of their calling. In those centers were found teachers, lay priests and early adopters of their ways of life. 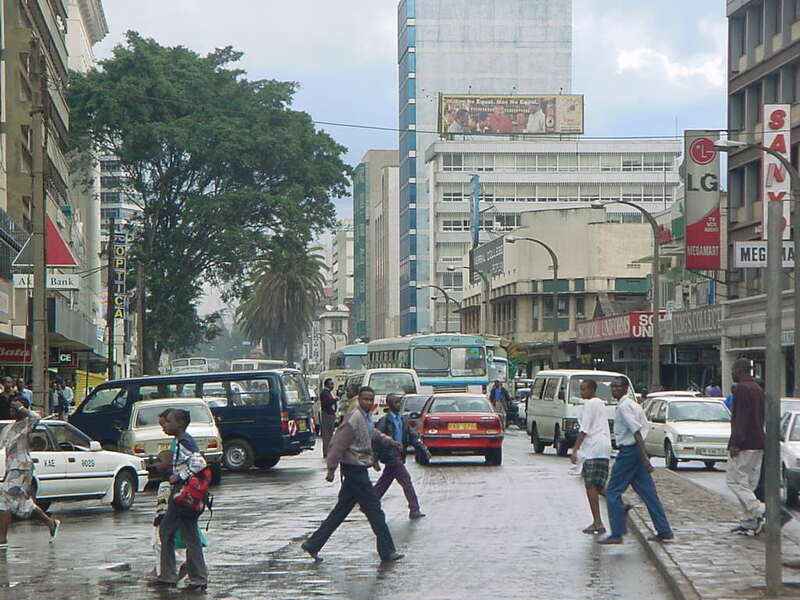 At independence towns like Nairobi, Kisumu, Mombasa, Nakuru and Kericho were a spectacle to be hold. They were spotlessly clean. The traffic flow for the few vehicles was excellent. Passenger buses and trains kept their schedules and picked their passengers on time. It was a pleasure to travel by train all over East Africa then. All that bliss has since changed your Excellencies. 47 years is a long time to expect things to remain the same. Now the wish list Kenyans have prepared for you is a long and frightening one. Their hopes have gone through the roof. The new breed that has come to cheer you at Uhuru Park is a different kettle of fish. They are young, educated and technologically savvy. They know their rights and are more demanding. They want to see real change from the past in real time. They will not listen to the same promises of fighting poverty, ignorance and disease Kenyatta promised his crowd five decades ago. They are no longer the ignorant lot but they are still steeped in abject poverty and dying of the same old diseases. The Uhuru Park crowd you are seeing there want you to urgently deal with tribalism, nepotism, poverty and corruption. They want to know that they are entitled to settle and live anywhere in the Second Republic. They want true access to land anywhere in Kenya at affordable rates. They want to be assured that they will be entitled to three meals a day, safety from crime, Medicare in any hospital and that none of them will be denied treatment on account of their poverty. They want to be guaranteed job opportunities so that they can bring up their families as civilized human beings. They want to know that under the new Republic, there will be no land clashes, ethnic violence or IDPs within our borders. The slum dwellers you are seeing at Uhuru Park are all from Mathare, Korogocho, Kangemi and Kibera. They have all been born in abject poverty. Some of them are aware that your government has been upgrading their neighborhoods. However, they hope that the Second Republic will not be as slow paced as has been in the past. They will expect decent housing, clean water, electricity and garbage collection in their neighborhoods as soon as possible. They will expect tarmac roads in their estates. Mind you; their rural cousins will expect the same too. This new generation is an impatient one. It is tired of politics of business as usual. They want to see corrupt people in jail rather than in Parliament. They want to see clean politics; not politics of cash handouts. They want to see public servants behaving like true servants of the people rather than their lords. They want to see land grabbers of yesteryears arraigned in courts, charged and jailed for theft of public and private lands. They want to see Anglo Leasing, Golden Berg and other thieves tried and convicted of economic against innocent Kenyans who have suffered for their sins. 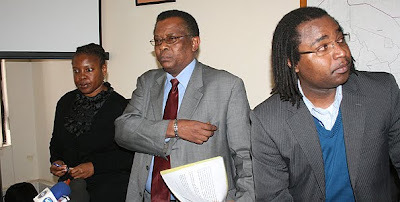 They want to see perpetrators of 2008 mayhem charged in court and murderers of Pinto, Mboya, Kariuki and Ouko brought to justice. They want to see justice on this land. Finally your Excellencies, they want to see MPs paying their taxes, police killings stopped and corrupt judges sent home post haste. Those Kenyans claiming that the struggle for the Second Liberation started 20 years ago are either lying to Kenyans or they are ignorant of our recent history. This struggle did not even start in the 1980s as some clergies are now claiming. At that time, the struggle had claimed Pio Gama Pinto, Tom Mboya, JM Kariuki and Kungu Karumba among others. 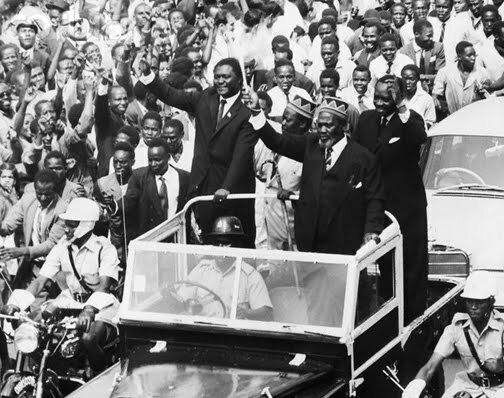 When in 1964 the Kenyatta regime disbanded the Senate, Regional Assemblies and consolidated the legislature, it was a sign that things would go terribly wrong. It was even more ominous when this arbitrary change of the constitutional order was never even referred to the people of Kenya to find out if they were comfortable with the amendments which literally took regional powers from them. Coupled with the fact that KADU the official opposition party was also persuaded to disband and join KANU under a defacto one party regime, it signaled the beginning of a government without a public watchdog. It is instructive to note that soon after Kenya became a one party state, it took just one year for the nation to mourn the murder of its first political heavyweight, Pio Gama Pinto and two years before Jomo Kenyatta fell out with his Vice President, Jaramogi Oginga Odinga over the government policy on land ownership. 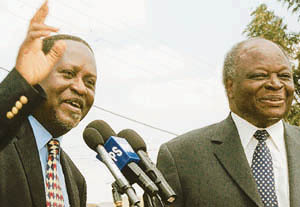 The fallout in Kanu that pitted Jaramogi against Mboya and Kenyatta could have been explained in simple terms as a petty rivalry between two Luo politicians jostling for power around Kenyatta. However, the truth was that theirs was on a point of ideological differences on how to share the resources of the new nation. Jaramogi could not understand how the new elite that had never fought for independence were being favored with White Highlands at the expense of real freedom fighters- the Mau Mau veterans. 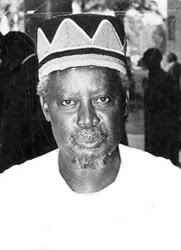 When the KANU Special Delegates Conference of 1966 neutralized Jaramogi’s powers within KANU, he quit the party he had cofounded while Kenyatta was still in detention and formed his own party – the Kenya People’s Union, the first opposition party since the dissolution of KADU two years earlier. At that moment, Parliamentary standing orders and the constitution were very clear on the process of switching parties in Parliament. It was a question of crossing the floor to a party of one’s choice to signal that one had lost faith in his or her party. The day Jaramogi entered Parliament as the leader of the new opposition party KPU, there was a near stampede on the floor of the house. Many MPs from all parts of the republic made attempts to cross the floor and indeed did and had it not been for the quick thinking of the likes of Mboya and Njonjo, Kenyatta’s government would have been dissolved in 1966. The duo came up with a creative amendment in the constitution and parliamentary standing orders stipulating that whoever crossed the floor to a party that never brought the member to Parliament must first resign and face a reelection under a new party. This move scared many would be defectors save for diehard ideologues like Bildad Kaggia, Achieng’ Oneko and Okello Odongo of Kisumu Rural among others from Eastern, Coast and Nyanza provinces. As this intrigue robbed Jaramogi an automatic formidable voice in Parliament, more surprises were to wait for him at the Little General Elections of 1966. When KPU candidates presented their papers for nomination to the then Government appointed Election Supervisor, most KPU parliamentary and civic candidates were disqualified on technicality by the provincial administration that supervised the elections countrywide. This first known election rigging was carefully and cleverly executed by the then KANU Secretary General, Tom Mboya who went to all the affected constituencies to ensure there were no meaningful and fair elections in KPU strongholds. At the end of the day, Odinga ended up with less than 10 MPs in a parliament of about 80 members. 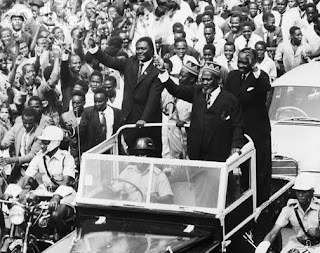 When Tom Mboya was assassinated three years later, the tragedy presented itself with a perfect opportunity to ban KPU, detain all its MPs and impose a curfew in Kisumu and Nyanza in general that lasted seven days. With opposition in parliament dead and Odinga in detention, it was now the turn of Odinga sympathizers like Bildad Kaggia and others in Nyanza to be purged. The era of the big man syndrome had finally arrived in Kenya. Nyanza may have borne the brunt of the Kenyatta dictatorship as early as six years after independence but the fact remains that after Odinga’s KPU was disbanded, no other Kenyan from any part of the country had the courage to speak against the system until the early and mid 1970s when JM Kariuki appeared on the horizon. The charismatic JM’s clarion call was simple and clear. It was wrong to have 11 millionaires in a country of 11 million beggars. What he meant was that within 10 years, Kenya’s population had grown from 6 to 11 million the majority of them living in squalor as a few rich people swam in wealth. JM’s crusade caused him his life in March 1975 exactly 6 years after Mboya’s assassination. By the time Jomo Kenyatta was dying in August 1978, the country was choking under the yoke of his dictatorship. The press, parliament and the civil society had lost their voices. The only broadcast station, VOK was all praises for Mzee Jomo Kenyatta. News about him opened and closed all prime time bulletins. Unfortunately when Daniel Moi took over, all he could tell the nation was that he would follow in Mzee’s footsteps. Those footsteps were to be our miserable lives for 24 years. The man was three times worse than Kenyatta. He ran down every economic and social gain under Kenyatta. He detained and killed more people through security agents than Kenyatta. For this despotism, he survived one coupe attempt in August 1982 when for 12 hours, the Air Force was in control of the country. With official brutality, corruption and destruction of national institutions becoming the order of the day, more resistance to this regime popped up from time to time. We had the Mwakenya underground movement, the George Anyona, Orengo, Raila, Mukaru Nganga group. We had voices of resistance coming from university dons that resulted either detentions or fleeing into exile. Therefore by the time Rev Njoya was calling for a new constitution in 1984 and thereafter joined by Bishop Henry Okullu, Alexander Muge and Dr. Gitari, the struggle had started much earlier. By the time Matiba and Rubia were joining the struggle 20 years ago, the real struggle for change had been on the table for a quarter century. AFTER AUGUST 27 2010 HOW WILL KENYANS BEHAVE? Will it be illegal for motorists to jump traffic lights and pedestrians to ignore red lights and cross our streets? Will it be illegal for matatus and city buses to block, harass and terrorize other motorists in our urban centers and national highways? 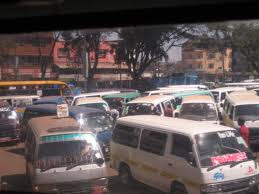 Will the constitution punish those matatus, buses and trailers that have caused the deaths of many Kenyans due to over-speeding and recklessness? What about those drivers and passengers that ply our roads without their seat belts on; or drive at breakneck speeds on slippery and wet roads on wheels as smooth as out bald heads? Kenyans have varied expectations of the new law that are as diverse as its many chapters and clauses. For some, especially the petty offenders such as changaa drinkers, touts and matatu drivers and other traffic offenders, the bliss belongs in the Bill of Rights where they will no longer expect arbitrary harassment and arrests from the Police Officer or Chief. Street hawkers and street urchins will also be shielded from the police. Their rights are firmly protected in the constitution. Effective midnight of July 27, Press Freedom will not only be guaranteed but absolute. Freedom to access information from any government official including confidential files over landmark cases, reports of commissions of inquiry, the Hansard records in Parliament going back one hundred years will be available to any member of the public that will care to access them. The Bill of Rights will guarantee every Kenyan food on the table, shelter, medical attention and free and compulsory primary education. Following the promulgation, there will be real and meaningful separation of powers between the three arms of the State. Members of Parliament will no longer serve in the Cabinet as has been the case in the last 47 years while the Judiciary will for the first time enjoy true independence from the Executive. Whereas the President will still have the powers to appoint constitutional office holders such as judges, permanent secretaries, cabinet ministers and heads of state corporations, the military and armed personnel heads, he will not have powers to choose them. Their vetting will be the prerogative of Parliament. In the past, the President had the powers to prorogue Parliament at will. In the new dispensation, Parliament will have its own fixed calendar controlled by the Speaker through the Parliamentary Service Commission. Unlike in the past when the Parliamentary Service Commission was a law unto itself in determining its own salaries and benefits, that power has now been removed from the august house and given to another independent commission that will determine the packages of all sectors of the public service. For the first time, there will be no DCs, PCs and Dos. The Provincial administration is an endangered lot since the 47 counties will become the new centers of power immediately the new constitution is promulgated. Instead we will have governors and local representatives to the County Assemblies come 2012. In Parliament, the supremacy of the National Assembly will also suffer loss of power as another chamber; the Senate will claim some powers from it including that of impeaching the President. More importantly, since senators will have larger representation than MPs, they definitely will wield more clout than MPs. Kenyans in urban centers will for the first time elect their own mayors directly as opposed to the previous system where mayors and county council chairmen were voted in by their councilors in a most undemocratic manner. Land distribution and allocation in urban or county councils will no longer be handled by councilors, mayors and council chairman. A separate land commission has been set up to deal with that explosive issue. In the past, our MPs have been everything to everybody. They have been our representatives in Parliament, CDF chairmen, cabinet ministers and officials of our political parties. Being an MP and a cabinet minister has nurtured the culture of believing that if one is appointed into the cabinet, it is like a reward to that constituency. In the end, Kenyans have stopped seeing the President, Prime Minister, Vice President and other national office holders as national leaders but rather as regional and provincial chiefs. The ministerial flag has been seen as the communal gateway to the resources of the nation. For the first time, women will enjoy greater rights and representation in all aspects of public service. Their numbers will substantially increase in the national assembly while they will match their male counterparts one for one in the Senate. In state corporations and national commissions, where the CEO or chairman is a man, the deputy will be a woman and vice versa. When the current Attorney General departs in the next 12 months or less, his successor will not have unlimited term as has been the case. The occupant of that office will serve a maximum of 10 years, more or less the same two terms as the appointing authority. Whereas the entire Police Force will be under one commander to be known as the Inspector General, criminals will not be allowed to hold public offices as is the case now where some members of the cabinet have criminal cases pending in court yet due to political expediency, the appointing authority cannot fire them. Finally the new law will force all constitutional office holders such as judges and MPs to pay their taxes in full. And for MPs, it will be a hard task completing five years in the august house. Their constituents will be watching their performance and will be entitled to recall them in case the need arises. Compared to many African, Asian and Latin American armies, Kenya’s armed forces have won plaudits from critics for generally knowing their place in society since independence. Save for 1982, they have known that they belong to the barracks and should leave those premises on hostile operations only by orders of their elected civilian bosses. They have spared Kenyans the misery of coups and counter coups. They have also alleviated the suffering of hundreds of thousands of Kenyans, especially in far flung areas, by sinking boreholes and providing medical relief services. And not least is the fact that some of the greatest athletes to blaze the tracks of the earth for the last 50 years have emerged from the ranks of Kenya’s armed forces. But our armed forces also have skeletons in their cupboard. For years since independence, units of the Kenya Army, often supported by the Air Force, did rotational tours of duty in North Eastern Province to combat banditry and rid the civilian population of illegal firearms. All infantry battalions of the Army either inherited from the colonial forces or formed after independence have undertaken combat operations in the province, beginning with the suppression of the secessionist war known as the Shifta campaign. What came to be known as the Wagalla Massacre took place in February 1984. Wagalla is a small locality in the arid wilds of Wajir District whose principal feature is an airstrip. The nomadic inhabitants of this place are predominantly members of the Degodia clan of the Somali people. It is these people whom security forces concluded were in possession of illegal arms and were using them to commit acts of banditry. It remains unclear whether the decision to disarm these people in the way things ultimately turned out was made at Defence Headquarters or Harambee House or whether it was a field operation decision made on the ground. Says Dr Musambayi Katumanga, a University of Nairobi senior lecturer in political science and security affairs expert who also teaches at the National Defence College: “History is always subject to re-interpretation because of the passage of time and the availability of new information. “To construct the truth of Wagalla would require total Government commitment. This would entail the institutional cooperation of the military. “Getting to the bottom of this ugly episode would require anthropologists, archaeologists and forensic scientists to establish the truth of the deaths that occurred there. “It is not in question that a decision was made in Nairobi to disarm those people. What is unclear is whether what happened went according to the orders or the operation ran amok on the ground. Says a retired army officer: “The battalion that carried out the Wagalla operation was 7KR. The officer of the rank of Major who led the operation has since died. Many have died too, but there are also many who are still alive. The 7KR – in full 7th Battalion, the Kenya Rifles – is the Kenya Army’s infantry unit based at Nairobi’s Langata Barracks. The unit was formed in June 1968. It received its regimental and presidential colours in December 1970. Its official resume proudly proclaims its bestowal of the Freedom of the City of Nairobi in 1973 and its selection as the unit to host out-going Commander-in-Chief Daniel arap Moi’s farewell ceremonies on December 30, 2002. Its maroon colours have been immortalised in the hearts of many Kenyan music lovers by the timeless musical group, Maroon Commandos, which is made up of servicemen from this unit. It is quite instructive that whereas Army records freely indicate the North Eastern Province operations of all infantry battalions across the years, the same does not apply for 7KR. Yet it is a fact that it was this unit that relieved 9KR from the Wajir theatre of operations in February 1984. Official records just show that 7KR was engaged in its first combat operations against Ngoroko cattle rustlers in Turkana district in January 1969. Though Wagalla was a catastrophic event, it was part of a process. Says this ex-officer: “Wagalla was only the biggest and bloodiest operation that we carried out. There were many more but of a lesser scale. “To tell you the truth, we had a very big problem with one cultural trait of the civilians there: their secrecy. Nobody knows how to keep a secret better than them. This officer makes a blood-cuddling admission – they shot many women, some with children on their backs long before Wagalla. It is more than 10 years since he left the army but he speaks with extreme discomfort and reluctance, notwithstanding the fact that he is assured absolute confidence. “During our tour there,” he says, “I made it a point to give all my soldiers of Somali origin off when it came to combat operations. So what exactly happened at Wagalla? He pauses for a while and strikingly starts to rationalise the carnage even if he is under no obligation to do so. “There are soldiers who will also need help because of what they did. TJRC can help a lot. According to this soldier, when all efforts to peacefully disarm the locals failed, a decision was made to do it with “maximum force”. He says: “What I honestly didn’t get to know was whether the orders came from Nairobi or they were issued locally. “From my own experience operating there, I guess it was a local order. Nairobi was too far and after strategies and plans have been laid, armed conflict always comes down to a fight between two men staring at one another. The local men were herded on the tarmac of Wagalla airstrip. It is impossible tell how many they were. All accounts indicate they were in the upper hundreds and it is quite plausible that thousands eventually died. The airstrip was surrounded by soldiers armed with general purpose machine guns and G3 rifles. The men were told to produce their weapons. Many protested that they didn’t have any weapons. That was a wholly unacceptable answer. The men were stripped naked and allowed to bake in the 40-degrees Celsius heat for hours on end. For people of that culture, this was supreme humiliation. They were not allowed food or water. From the time they were rounded up, the beatings with rifle butts were continuous. Those who were foolish enough to question the humiliation were summarily shot in full few of their fellow prisoners. There many deaths by the second day. Some had died of the beatings and gun shots. Some had convulsed in the heat and simply passed out. But amidst all this, there were still others who dared stand up for manly honour. A horrible fate awaited them. Their hands were bound behind their backs and loaded into a helicopter. The chopper rose and hovered above the prisoners. At some point, the bound men would be pushed out of the open door. They fell to their deaths hundreds of feet below as other men watched, awaiting their turn. This was repeated several times. At about the fourth or fifth day, it occurred to the surviving and famished prisoners that nobody would leave this place alive. As if taking cue from the prisoners depicted in the movie “Escape From Sobibor” – a depiction of the dramatic escape from one of Nazi Germany’s most notorious death camps – Wagalla’s tragic survivors started running in all directions. At first the soldiers, who were also exhausted from the beatings and killings, were too surprised to react. And then they did. A hail of fire was sprayed in the directions of the fleeing men. Many fell. But some survived. And it is their narratives that told the world what had happened there. Because they come from a traditionally marginalised area of Kenya, their stories elicited only lukewarm reaction from the rest of the Kenyan population. Even today, the tragedy of Wagalla excites few Kenyans. Had it happened to a “mainstream tribe”, this is a story that would be told over and over again. It would never leave the political discourse. TJRC sources, confirmed by Betty Murungi and Ronald Slye in their Sunday Nation piece, affirm that when asked if he was ever in Wajir, Bethwel Kiplagat replied that he could not remember. In a heart-rending moment of introspection, and in very few words, this ex-soldier makes a compelling case for a TJRC: He says: “Do you know that the perpetrators sometimes suffer more than the victims? As it has been said, every cloud has a silver lining. For the people of Kenya, in whose name this horrible act was committed, there is a saving grace from the story of Wagalla and 7KR. Through the presidencies of Jomo Kenyatta and Daniel Moi, the state agency that came to symbolise torture as an instrument of governance was the Special Branch. Nyayo House and Nyati House, their lairs, were Kenya’s miniature Gulags. Many Kenyans’ lives were shattered there. At the height of the Mwakenya terror campaign, the Special Branch could count as its ideological soul mate ignominious outfits such as Idi Amin’s State Research Bureau. Abductions and disappearances were all part of a normal days’ work. It banished its name and terror practices under the leadership of Brigadier Wilson Boinet and became the professional National Security Intelligence Services it is today. Kenyans have not remotely connected the NSIS with torture. Brigadier Boinet was a product of 7KR. He was the unit adjutant in 1979. NEW LAW A TRIBUTE TO KENYATTA- REALLY? 1890s: Born Kamau wa Muigai to parents Muigai and Wambui in Gatundu. 1952: He and five others are arrested over Mau Mau activities. 1961-1962: leads the KANU delegation to first and second Lancaster Conference in London where Kenya’s independence constitution was negotiated. The passage of the new constitution was Kenyans’ reward for the country’s first head of state, it was said on Sunday. President Kibaki, who led Kenyans in commemorating the 32nd anniversary of the death of founding President Jomo Kenyatta, said Mzee’s dream of a prosperous country would be realised with the enactment of a new constitution. “It is a big way of saying Thank You to Mzee. He left us a big country... let us build it now. I don’t see why anybody wants to make himself miserable by doing anything else,” he said after laying a wreath at Kenyatta’s mausoleum at Parliament Buildings. The President, together with the Kenyatta family and wananchi(citizens), later attended a memorial service at PCEA St Andrews Church in Nairobi. The president said the best way of thanking the founding fathers of the nation is to ensure their vision of a great Kenya is realised. “Mzee Jomo left us a great nation and what we are called upon to do is to ensure that we carry on with the work of building it further into greater heights,” President Kibaki said. He said Mzee was a great leader who stood firm on his principles and ideals of making Kenya a proud country. “For the younger generation who are not aware of the great achievements of Mzee Kenyatta, I would like to encourage you to carefully read the history of Kenya and you will see how great a man he was,” he said. He said Mzee stood for what he fought for before detention and after. “He talked to people in a vivid manner, not remembering the time he had suffered. The president was accompanied by Vice-President Kalonzo Musyoka, National Assembly Speaker Kenneth Marende, Finance Minister Uhuru Kenyatta and former First Lady Mama Ngina Kenya. Mr Musyoka asked Christians to dedicate next Sunday for thanksgiving for birth of new republic. PCEA moderator David Gathanju said it is everybody’s responsibility to make the new constitution work. Mr Kenyatta, who spoke on behalf of the family, said if his father were alive, he would have been proud of Kenyans for endorsing the new law. “Kenya is not living in its past but present and is transforming itself for future generation,” Mr Kenyatta said. He was neither a good president or a true liberator just a glorified "Home guard"
Mr. President you were doing very well until you decided to "reward" the founding father. Am I dreaming or what?? The overwhelming support for the new constituton has ABSOLUTELY nothing to do with mzee Kenyatta. Period. He is the number one reason why kenya is in a mess. Be honest Mr. President and tell the true story. Kenyans, I am abit baffled by our president. Mzee Kenyatta is one of the reasons we've had to fight to get a new constitution. He engaged Kenya on a wrong footing, despite his nationalist credentials, then left us Moi, to finished the pathetic job. Are we just getting carried away while remembering the dead? Honestly, it’s only a tribute to us all who have endured their destruction of our nation, and the valiant vanguards who championed the course; Pinto, Jaramogi, Kaggia, Anyona, Muliro, Mkangi, Adungosi, Raila, Kituyi, Karua, Orengo, Imanyara, Njoya, Okullu, Cheluget, Ngilu, Koome, Nyong'o, Muite, Khaminwa, et al!!! I disagree mr prezzo. That mzee who was the first president of kenya initiated all that's wrong with political life in this country. He messed us up. It is hypocrite to think let alone even say that the Kenyans voted in the new law for the sake of Kenyatta. The mzee failed the country by leaving behind a country divided along tribal lines. He is the one responsible for leaving, after his separation from power by nature, a dynamite in the name of Moi that exploded the country bit by bit for 24 years.